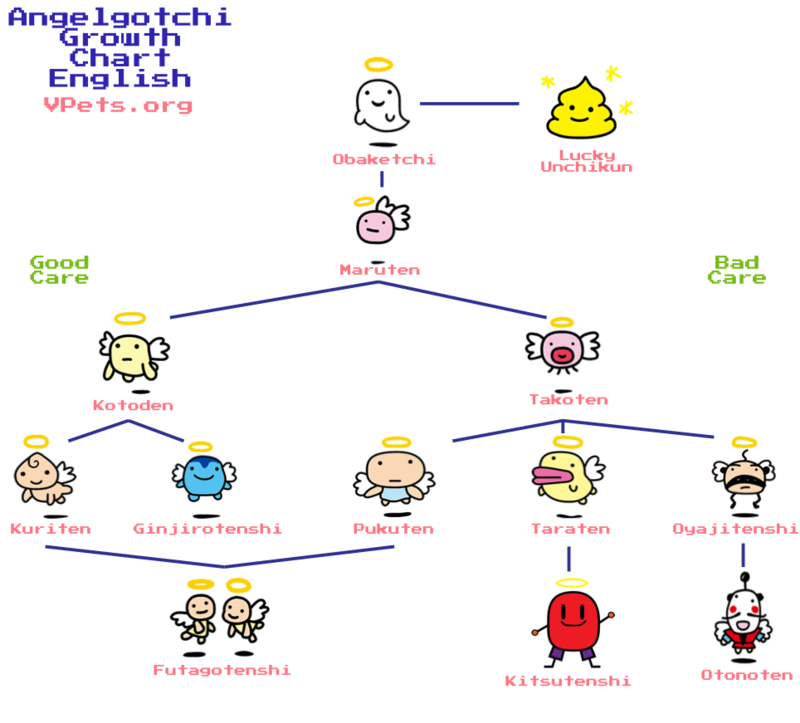 The Tamagotchi Angel is a favorite among many collectors. It was released in Japan in 1997 and worldwide in 1998. Japanese versions came in white, pink, and blue, while the worldwide English versions also came in yellow. The Japanese shells say "Angelgotch" at the top, while the English versions say "Tamagotchi Angel". The Japanese and English versions also has a secret character difference. 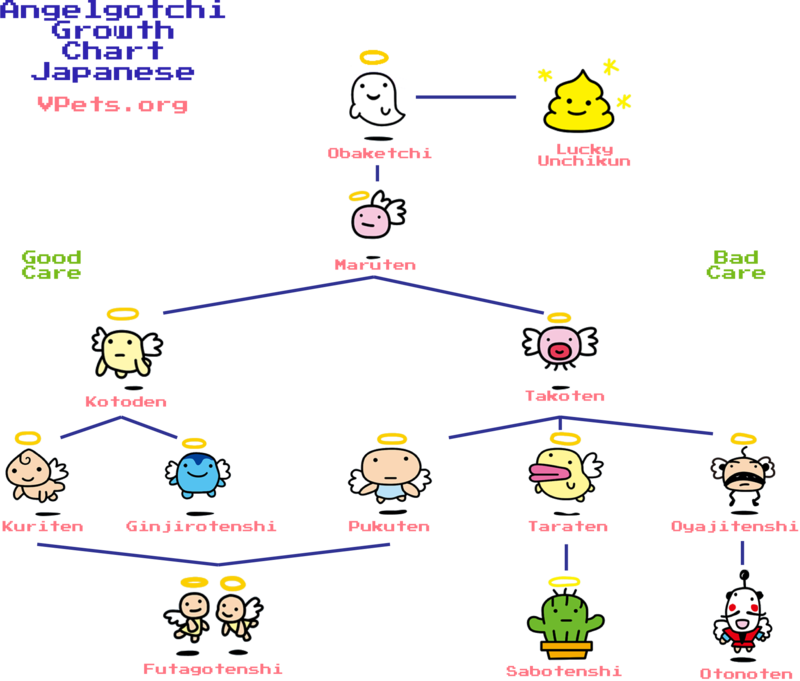 The Japanese version can obtain Sabotenshi from Taraten, while the English version can obtain Kitsutenshi from Taraten. When you first startup an Angelgotch, you will see a grave and ghost floating on the screen. Press B to go to the clock screen. Set the time using the A button for the hour, and the B button for the minutes. Press C to confirm the time. Wait 5 minutes, and the angel will be born. The status screen is where you will see all the information about your angel. The first screen shows the age and angel power. Angel power replaces weight in this Tamagotchi version. You can increase Angel power by feeding your angel treats or having it do good deeds. Sometimes when feeding a treat, a bat will show up to try to steal it. Tap on the screen or case until you scare the bat away. This utilizes the sound detection feature of the Angelgotch. Try to keep your angel power as high as possible! The good deed bar is raised by having your angel go out and perform good deeds around the world. You have to wait for your angel to call for it, then select the deed option. This functions exactly like discipline on regular Tamagotchis. Hunger is how hungry your angel is. Feed it pies to fill the hearts. The happy hearts show how happy your angel is. Play the game to fill these hearts. You can feed your angel pies as a meal. Chocolate is the treat. Pies will fill the hunger meter, while chocolate will increase angel power. The object of the angel's game is to dodge the shooting stars. The star will move from the right to the left part of the screen. Press the B button to jump over the star. Pressing B too early or too late will result in your angel being carried off by it. If you successfully dodge all the stars, it will fill two happy hearts instead of one. Use this option to clean up your angel's poop. This option replaces discipline on the Angelgotch. Your angel will call out to you, and will be moving differently on the screen, usually smiling. It is signaling that it wants to do good deeds. Use this option to send your angel out to perform good deeds. This will increase the good deed bar. Sometimes your angel will get sick. Use this to cure it. When your angel goes to sleep, you need to turn the light off. Use this option to turn the light on and off. When your angel wakes up in the morning, the light will automatically turn on. This icon will light up when your angel needs care. Sometimes your angel will disappear from the screen. On Japanese versions you will see a door. Tap the shell or screen for your angel to return from its stroll. To mute your Tama's sound, press both the A and C buttons simultaneously when on the character screen. To set the time, press the A and C buttons simultaneously while on the clock screen. Use the A button to set the hour, and the B button to set the minutes. Press C to confirm the correct time. There are two different character evolutions that are poop. One is a pile of poop with no face. It can be obtained by completely neglecting your angel in its infancy. You cannot take care of this character, or interact with it much. The second poop character is the ever so elusive Lucky Unchikun. Unchikun looks just like the regular pile of poop, except he will have a face. This is a character that you can care for like any other angel, but it is incredibly rare to achieve. So far, in the collecting community, we know of only one person to get it so far through a video posted on YouTube. Many have tried, but Lucky Unchikun is like one in a million!